Super Hero Boy: Connor's favorite Bob The Builder DVD ever... or so he says! Connor's favorite Bob The Builder DVD ever... or so he says! We have done reviews on quite a few Hit Entertainment compilation dvds.. you know the ones that have episodes from Barney, Bob, Thomas, and their other shows. Quite often we even get all Barney or all Thomas dvds but it seems there are never enough Bob episodes. Connor loves everyone from the Hit Entertainment shows but it really seems more often than not he will ask for Bob in particular (or Fifi.. another one we never see enough of it seems) and I end up having to skip through a few episodes just so he can watch Bob. Needless to say he was absolutely thrilled when the new Bob The Builder : The Best of Bob The Builder dvd arrived in the mail! There are THREE whole hours of Bob and his friends included on this dvd in TEN episodes. That's enough Bob to keep even Connor occupied for awhile. Included are : Lofty To The Rescue, Mucky Muck, Dizzy Goes Camping, Bob's Big Plan, Two Scoops, Off-Road Scrambler, When Bob Became A Builder (our favorite on the dvd), The House That Lofty Built, Bob's Big Idea, and Roley's Flat Garden. Not to mention a thirty minute special never before seen feature from the On Site series about trains. Also there are two dvd games as well! 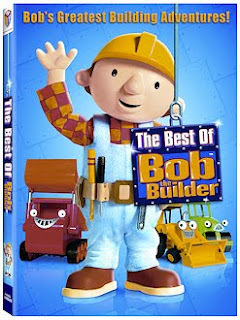 If you have a Bob the Builder fan on your hands this is a must have dvd not to mention it has the most episodes I've seen on a Hit Entertainment dvd in awhile. Ten episodes is huge compared to most of their dvds having five! Bob The Builder : The Best of Bob the Builder is available right now on Amazon!